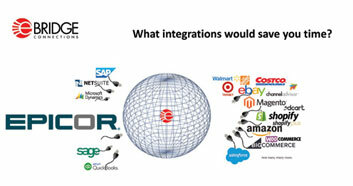 eBridge has developed a universal integration solution that allows data to flow to and from disparate business systems. This is made possible through eBridge’s hundreds of system “connectors” such as Epicor, Amazon, Shopify, Big Commerce, Magento, and Salesforce to name a few. With this user-friendly system, clients can simply add or remove connectors as needed and pick the data flows or ‘touch points’—orders, inventory levels, and tracking numbers, they require. “We have over 5000 live touch points running right now,” states Brown. With more than 600 customers, and 23 years in the business, eBridge offers full end-to-end support for their solution and unlimited 24/7 access to a North American-based in-house support team. In addition, eBridge does not charge by transaction volume. Instead, they have a flat rate starting price of $1,000 per year for each touch point plus set-up. In an implementation highlight, one eBridge client sold their product through drop shipping to more than 70 different trading partners. They needed an integration solution provider that could handle high volumes of document exchange. eBridge set the client up with an automated solution for their first few trading partners, and then allowed the client to duplicate the process and write their own maps for 70+ more trading partners. The client was able to drastically improve the speed of their data exchange and accuracy alongside the opportunity to improve their trading partner relationships and gain efficiencies within their supply chain.